Did you know that your bedroom paint color can impact how well you sleep? When new homeowners move into a new house, one of the first projects they tackle is to paint the walls. So, naturally my clients ask about the best paint colors for the bedroom, and many wonder which colors will help them sleep better. Which bedroom paint color is best for sleeping? According to many sleep studies, blue is the best color for a good night's rest. Blue is associated with calmness and helps reduce blood pressure and heart rate. That's one of the reasons so many people love blue and use that color in places that where people would like to relax. According to Sleep.org, the reason has to do with how our eyes function. We have specialized receptors in the retinas of our eyes - called ganglion cells - and these are most sensitive to blue. They relay information to our brain that controls our 24 hour rhythm (i.e. our circadian rhythm). Since blue relaxes us, and lowers our blood pressure and heart rate, this helps us fall asleep faster and sleep better (as well as longer). Most shades of blue (especially cooler bluer tones, as opposed to aqua tones) aid in sleep. 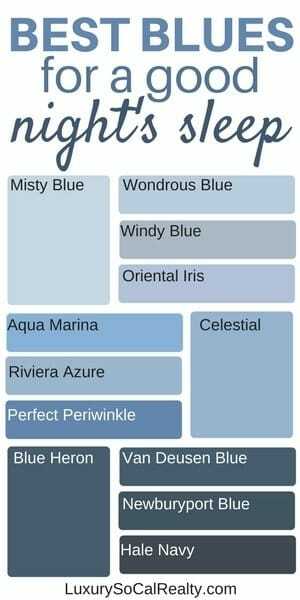 It could be a light baby blue, a deep blue (think lakes and oceans) or even a navy blue...whichever shade of blue you love, that's the one you should choose for your bedroom. Interesting enough, a study from Travelodge.co.uk showed that people who have blue walls get the longest amounts of sleep AND have the highest percent of people that wake up happy. What other colors are great for the Master bedroom? 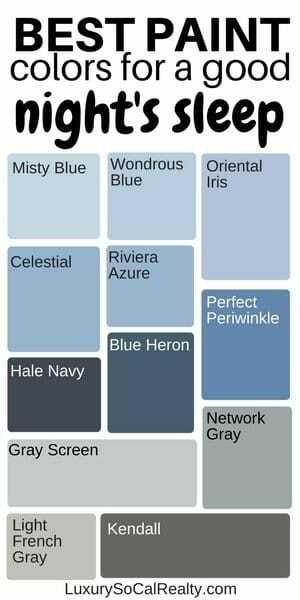 If blue isn't your color, then select other cool and relaxing tones such as grays, silvers and other neutral tones (e.g. greige). If you find a color that you love, and it's a relaxing color for you, then it's a great choice. 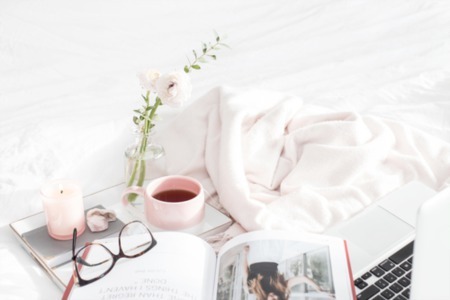 Your bedroom should be your sanctuary, and when you come home for the day, you want to relax and just say "ahhhhh." So, pick what you love and makes you calm. 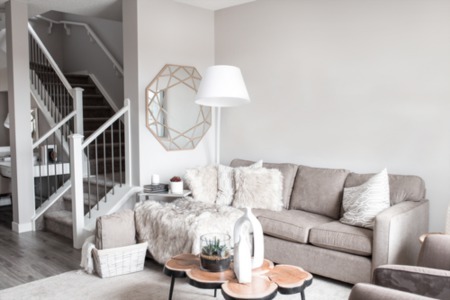 If you're looking for gray (which is currently the most popular paint color), you may want to check out this article on how to find the best shade of gray paint and how to choose a gray accent wall. 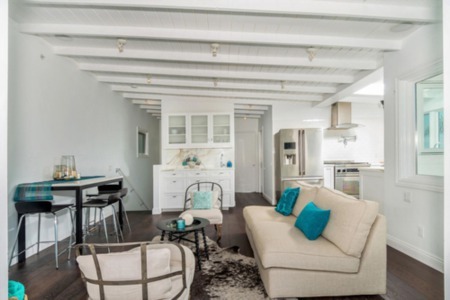 You'll be happy to know that blues and grays tie in with the latest home remodeling trends. If you love greens or beiges or other colors, try to select a cooler green or maybe even a taupe (a mixture of green and gray)...or for beige, try a greige (a mixture of gray and beige) as these tend to be more relaxing and will help you sleep better. Avoid colors that have strong yellow undertones as they may keep you up longer. Also, yellows are a bit dated now, and it's easier to decorate with cooler colors. You want to try to avoid warm and bright colors, especially red, oranges and bright yellows. These actually keep you up longer and make your heart beat race and increase your blood pressure. So, if your goal is a good night's sleep for you (or your kids), avoid these colors. Interesting enough, reds tend to make you hungrier, too (this is why you see so many pizza restaurants using reds). Some studies have shown that a pale yellow can also work for a good night's rest. This may be because it's opposite on the color wheel as blue. While this would not be my first choice (for a good night's sleep), if you use yellow, make sure it's a very pale yellow. If one of your kids is dead set on a bright color, you may want to consider using this color just on one accent wall. Obviously, paint color is only one part of the equation. There are many other things you can do to get a better night's sleep. And, when these activities are combine with a cool toned paint color you love, they will become synergistic. The ideal is to go to sleep at the same time every night and wake up at the same time. Your body seems to be the most conditioned this way, and you are more likely to awake with more energy. If you go to sleep later, try to at least maintain the same time wake up time. If you decide to sleep in on the weekends, try to only sleep an extra hour or so. If not, you'll feel more tired on Monday. (Mondays are hard enough already, so let's not make them any harder). Our eyes are more sensitive to the blue light that electronic devices emit, and this can inhibit production of melatonin which is a hormone our body naturally produces to help us fall asleep. Most doctors recommend turning devices off 1 hour before going to sleep. It also helps if you eat at a consistent time, and it's important to make sure you don't eat right before bed. Allow at least 2 hours for digestion before you go to sleep. Of course eating healthier will also help. This will help you avoid waking up to go to the bathroom. Yes, we sleep better in darker places, and it also helps if you start to dim the lights (or turn some off) an hour before you intend to go to sleep. Nicotine and caffeine are stimulants, so they will keep you awake. So avoid coffee, tea, chocolate and smoking before you intend to go bed. Also, try to avoid arguments in the evening. This can aggravate you and make you more irritated which in turn will make it harder to sleep. Exercise can also help you fall asleep sooner, and feel more refreshed both during the day and the next morning. It's better to exercise earlier in the rather than late at night. If you exercise late at night, the stimulation will make it harder to fall asleep. In addition to retiring at the same time every night, consider a nightly activity that will help calm you and fall asleep. This could be reading in bed or even taking a warm bath (or shower). The warm bath has a bonus as it helps you fall asleep as it cools you down. As you can see, choosing a cool and soothing paint color for your bedroom can help you sleep better. Blues tend to work the best, followed by grays. But, this is only part of the equation. Be sure to supplement this with all 5 senses for a synergistic approach. And, getting into a consistent sleep time routine will really help.